Galileo's use of the inclined plane to study the motion of objects is one of his most important contributions to science. As this video segment from NOVA illustrates, the inclined plane allowed Galileo to accurately measure the effect of gravity on falling objects and develop a universal law describing this effect. 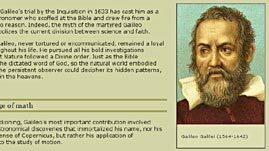 Source: NOVA: "Galileo's Battle for the Heavens"
This resource was adapted from NOVA: "Galileo's Battle for the Heavens." Galileo thought a great deal about the motion of falling objects. Specifically, he was interested in the forces that acted upon objects in free-fall and whether those forces affect different types of objects differently. In Galileo's time, Aristotle's centuries-old assertion that heavier objects fall faster than lighter objects was almost universally accepted. Even today, most people would predict that a feather will drift to the ground more slowly than a hammer, but they might not be able to explain why. Galileo acknowledged this difference in falling time, but wondered if it was due to the mass of the objects and gravity's pull on that mass, or to some other force that was being overlooked. For years, he conducted real-world experiments and "thought experiments" to test his ideas. Most falling objects move quickly. Even with a modern stopwatch, it is difficult to accurately measure an object's free-fall velocity or its rate of acceleration. Having no such timepiece, Galileo might have considered a study of falling objects impossible. However, Galileo was nothing if not ingenious. 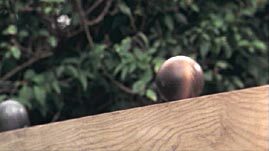 He had the idea that a ball rolling down an incline would accelerate in the same way as a free-falling object, but more slowly. Using a straight, gently sloped piece of wood with a groove running down the center -- an inclined plane -- he was able to "dilute" gravity's effect. The inclined plane thus allowed Galileo to accurately measure acceleration with simple instruments and ultimately to prove that, in the absence of other forces such as air resistance, gravity causes all falling objects to accelerate toward Earth at the same rate. How did Galileo slow down motion so he could measure the motion of a falling object? Make a chart that shows the pattern Galileo discovered when he measured the units of distance a falling object covers in each unit of time. Use a sketch to explain what "this beautiful numerical progression--one, three, five, seven" means. What is special about the sums of odd integers? Why do the 50 stars on the American flag fit so well? Try adding up the rows of stars, starting in a corner. Notice the sequence 1+3+5+ and so on. Why does it stop at 9? Witness Galileo's famous struggle to persuade church authorities of the truth behind his discoveries about the cosmos. Test out some of Galileo’s famous experiments with falling objects, projectiles, inclined planes, and pendulums. Galileo, “the father of modern physics” set out to understand the mathematics of motion. A professor from one of the CERN teams explains what this experimental result means for the future of physics. Forging heavier elements from lighter ones used to be the sole domain of stars and supernovas. But not anymore. You can make your vote incredibly secure on Election Day—all thanks to quantum mechanics. When you send a text, how does your message make the journey to your friend’s phone? The concept of "space" is a tough one to explain, even for a Nobel prize-winning physicist. Physicist Peter Galison says that humans sense time as moving constantly forward, but it doesn't really work that way. Physicist Sean Carroll says there's no such thing as past or future in the elementary laws of physics. Physicist Max Tegmark says that time is still one of the biggest mysteries in physics. Physicist Janna Levin says that Einstein and Newton had very different ideas about what space and time really are.